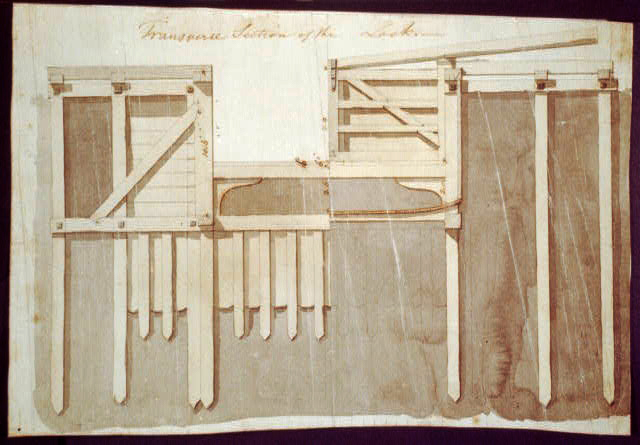 “Washington Canal lock details and sections,” Histories of the National Mall, accessed April 25, 2019, http://mallhistory.org/items/show/266. Henry Latrobe, an architect of the US Capitol, was also the chief engineer of the Washington City Canal. He prepared drawings of the canal locks in 1810, before construction began. The Canal was about one mile long and passed in front of the Capitol. According to Latrobe's early drawings, the canal lock located at 17th and Constitution Avenue was likely a vertical sluice gate. The lockkeeper would manually raise and lower the gate to control the flow of water in the canal.